KITCRV3: rechargeable CR-V3 Li-ION battery AND a Desktop-Mobile Smart Charger. Includes Power Supply to use from a wall outlet, and also has a 12VDC Vehicle Power Cord. Enables safe, smart, quick charge with automatic shut-off. The CR-V3 Li-ION battery replaces a CRV3 or 2 x AAs. 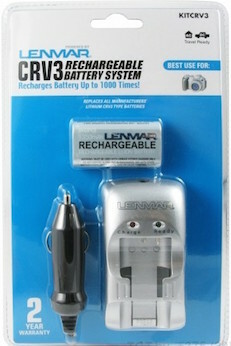 The P-CR-V3 is a 3 volt 1300mAh Rechargeable Lithium Ion (Li-ION) battery for Digital Cameras that use the CR-V3 primary battery. Can also fit in cameras that use 2 x AA cells. Re-charges with the KITCRV3.